RNA, like DNA, is a polymer of nucleotides. Each nucleotide consists of a sugar that is attached to a phosphate group and any one of four bases. The RNA polymerase, as it builds the chain of nucleotides, processes only one of the two complementary strands of DNA. This DNA strand is referred to as the template strand. The least confusing name for the other DNA strand is "the nontemplate strand." The bases in the newly synthesized RNA are complementary to the bases in the template DNA strand and, therefore, identical in sequence to the bases in the nontemplate strand, except that the RNA contains U where the nontemplate strand of DNA contains T.
Figure 1. Various steps in the process of transcription. (A) Assembly of the initiation complex. Depending on the conditions RNA polymerase can either bind free general transcription factors and then the promoter, or the general transcription factors that are already promoter-bound themselves. In either case, the upstream binding factors facilitate the interaction of RNA polymerase with the promoter. 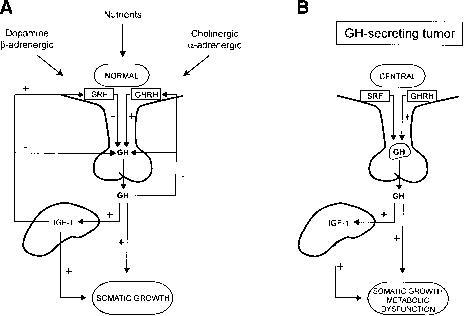 Note that only one of the upstream regulatory sites is depicted as having a regulatory factor bound. (B) Initiation of RNA synthesis. At precise locations as determined by the promoter DNA sequence, the first and second RNA bases bind to the complex and RNA polymerase catalyzes formation of a covalent bond between them (thick line represents a short, released, abortive transcript). The vertical part of the arrow indicates the position on DNA where RNA synthesis commences, the horizontal part the direction of movement of RNA polymerase on the DNA. (C) Elongation. After promoter clearance, the RNA polymerase extends the growing RNA chain across the gene (the thick line is the growing RNA transcript). (D) Termination. When the elongating complex reaches the terminator, RNA synthesis stops and the complex is released from the DNA. RNA nucleotides link together by dehydration, the removal of a water molecule and the bonding of the remaining atoms. 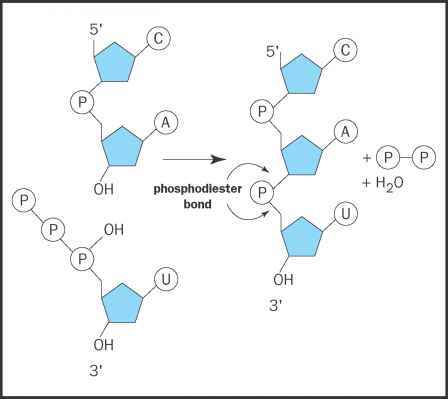 The pair of P-O-C linkages connecting the two sugars is called a phosphodiester bond. The triphosphate of the incoming nucleotide provides the energy needed to carry out this reaction. Before the nucleotides are linked together, they exist separately as ribonucleoside triphosphates (NTPs). As shown below, the NTPs contain one of the four common RNA bases, A, C, G, and U, linked to a five-carbon ribose sugar, linked, in turn, to a chain of three phosphate groups. During RNA synthesis, a covalent, "phosphodiester" bond is formed between one of the three phosphate groups on one NTP and a hydroxyl group on another. The two other phosphate groups that were part of the original NTP are released. Initiation. The first phase of RNA synthesis is initiation (Figure 1B). Initiation starts when the first phosphodiester bond is formed. At precise locations, determined by the promotor DNA sequence, the first and second RNA bases bind to the complex, and RNA polymerase catalyzes the formation of a covalent bond between them. When the growing RNA chain reaches a length of about ten nucleotides, the complex loses contact with the promoter and starts moving along the DNA. This is referred to as promoter "clearance" or "escape." Only a fraction of initiation events lead to promoter clearance. In many instances, an "abortive" RNA molecule, shorter than ten nucleotides, is released from the RNA polymerase, and RNA synthesis begins all over again. Such an abortive molecule is shown in the figure as a thick line.